-Today’s inductee Jed Hamoud and wife Becky. We mourn the recent passing of two NBMV Rotarians, John Marg-Patton and Char Samuelson. Cindy Carlson noted that memorials for her Co-President John Marg-Patton were preferred to NBMV Rotary and the total contributions were in excess of $4,000. John’s wife Ruth sent a card expressing her gratitude for our support for their family during this difficult time. Former Rotarian Char Samuelson’s memorial service was held this past weekend. Gerry Tietz delivered one of the eulogies, outlining the many ways that Char exemplified the rotary motto: “Service Above Self”. Both John and Char made a big impact on this club and their community and they will be sorely missed. 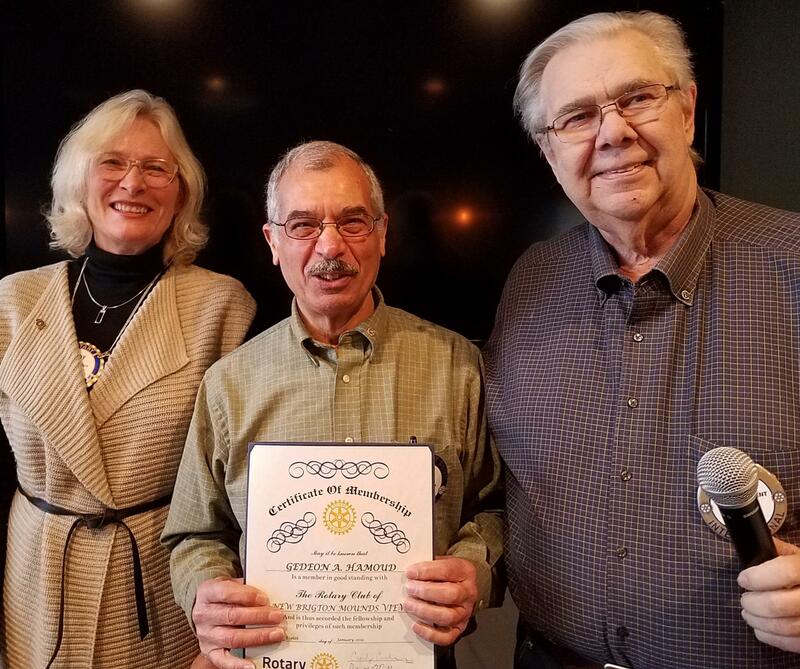 Cindy Carlson and Gerry Tietz shared the honor of inducting a new Rotarian, Jed Hamoud. Jed has presented to the club many times about his efforts to provide education for Syrian refugees in Lebanon. Jed will make an excellent addition to our club. Nils Friberg and Margaret offered words of praise for Jed’s character as well as his charitable efforts. Jed’s wife, Becky was present for his induction. Cindy, Jed and Gerry are pictured below. Maria Klakegg, our Norwegian exchange student, was here today and Ed James presented her with a check from the club (below). Cindy presented a holiday gift to the staff of the Exchange for their excellent service over the past year (below). 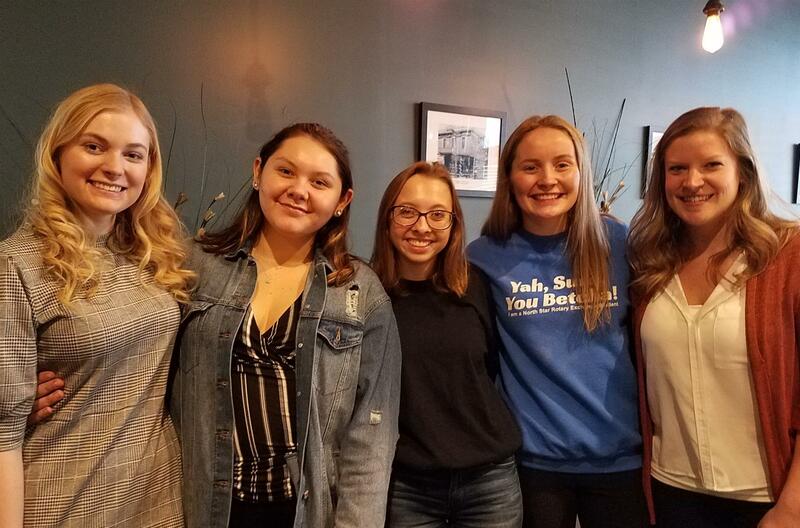 Irondale students Ellie Goligowski and Breanna Garcia spoke briefly about their amazing experience as our representatives to Camp Enterprise. They said that there were five speakers, each focusing on an aspect of marketing strategy. Each team developed a product and a business plan with the help of Rotarian mentors. They presented their plans to a panel of “investors”, ala Shark Tank. Both students praised the program and thanked us for providing the opportunity for them to attend. 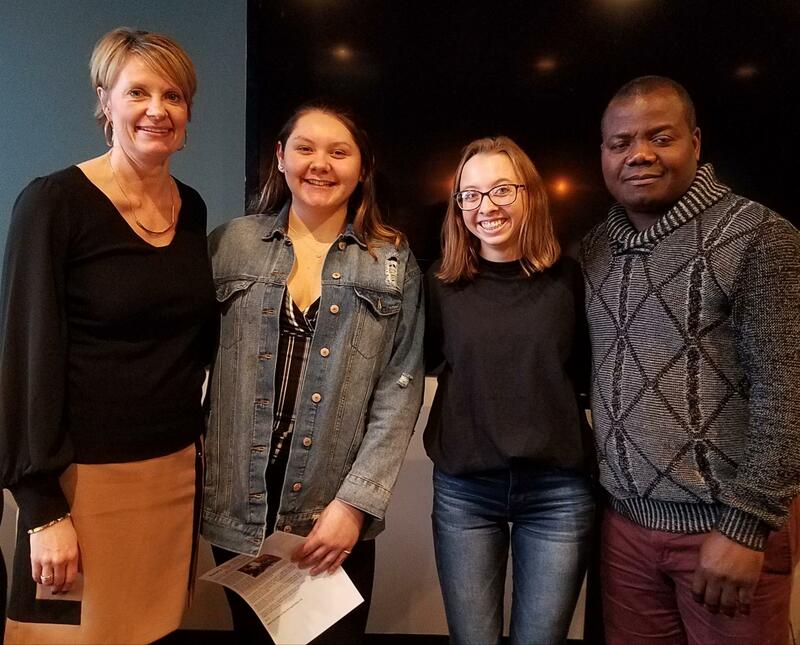 Irondale Principal Amy Janecek, Breanna, Ellie and Ed James are shown below. Saturday, February 23rd, is the date for our Club’s 40th Anniversary Party at the New Brighton Community Center. The fun begins at 5:30PM and the cost is $30 per person. We’re inviting as many previous Rotarians as we can get a hold of, so if you are in contact with any former Rotarians, please get their contact information to George Winiecki or Nicole Ulrich. We could really use some help addressing and stuffing envelopes for the invitations this Thursday, 4 PM at the Exchange. Our Gold Plate Dinner is coming up on Friday April 12th. The next planning session will be on Tuesday January 15, 11AM at the Exchange. The tickets for the event will be available soon. Cor Wilson has retired and terminated her membership, but she’s not forgotten. Join us at our noon meeting on January 22 to give Cor a proper send-off. Cards or other mementos are appropriate. 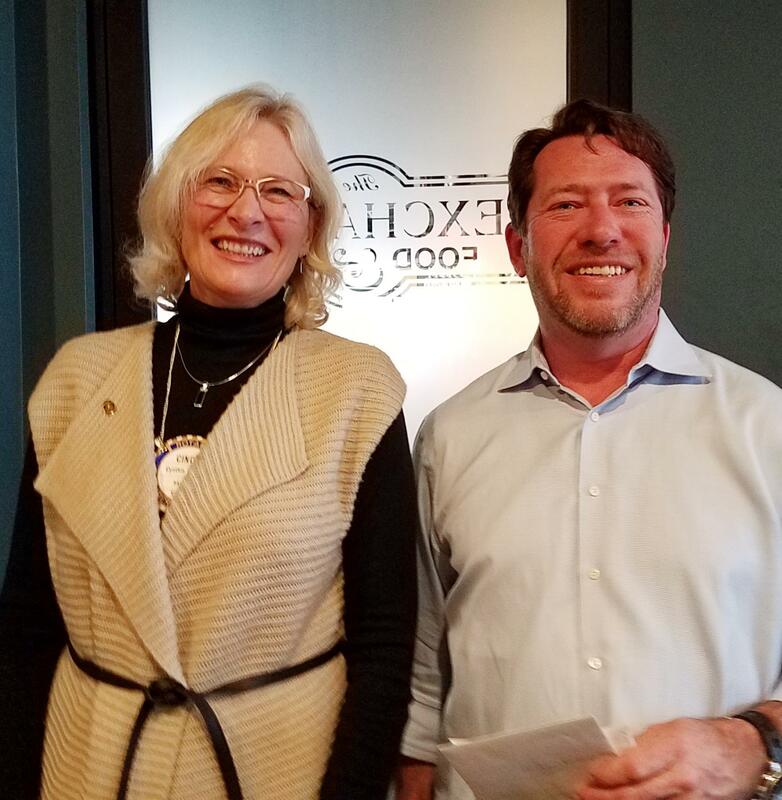 Margaret Johnson has arranged with the St Paul Rotary Club for the transfer of $10,000 of Foundation Recognition Points to our club to help promote contributions to the Foundation’s Polio Plus Fund. NBMV Rotarians will receive one bonus recognition point for each dollar contributed to Polio plus in the next few months. Don’t wait to take advantage of this special deal. Cindy noted that the District 5960 Mid-Term will be held at the Anderson Center, Hamline University on January 12th, from 8:30AM to 3:00PM. There’s no better opportunity to learn more about Rotary. To register, or just check it out, click here. Cindy introduced Laura Skubic, to speak to us about her cultural exchange to Lebanon. 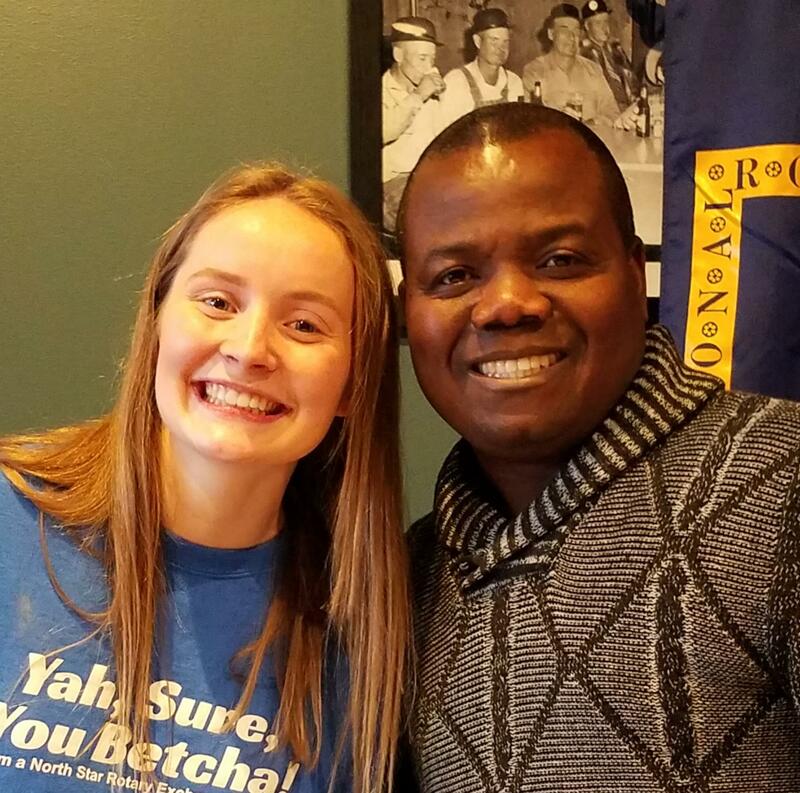 Laura is the Secretary of the Twin Cities Rotaract Club., where she learned about the cultural exchange program. After several application and interview steps Laura was accepted for the August 2108 exchange. The Baabda, Lebanon Rotary Club (Dist. 2452) was the host club for the one week exchange, and Laura was blown away by the hospitality of her hosts, especially at meals which were generally a three hour affair. Because of the short time frame for the trip, the sightseeing and cultural experience was rapid-fire, which allowed her to experience so much, but left her wanting to return for a more complete view of Lebanon. She was surprised by the variety of climate and scenery and her photos told the story of a beautiful country very unlike the typical stereotype of Middle Eastern countries. She also had the opportunity to learn about a variety of Rotaract service projects from around the world. 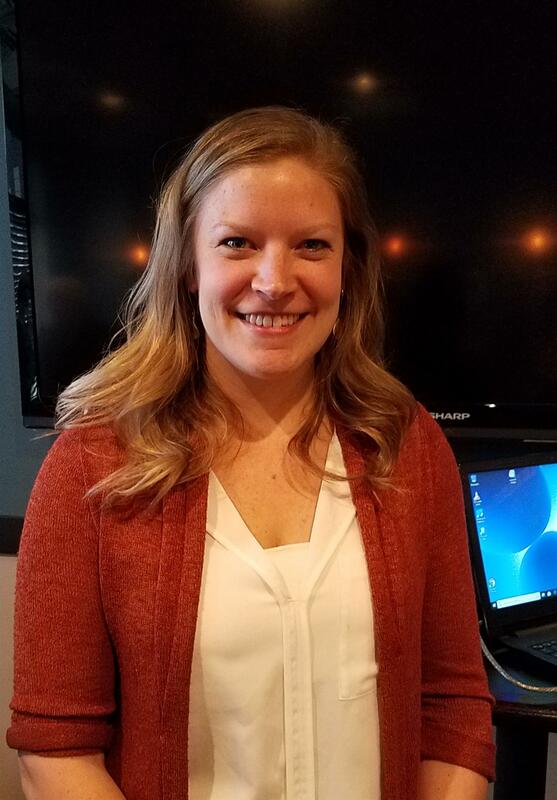 Laura answered our questions about the Twin Cities Rotaract Club. T.C. Rotaract has 15 members, ranging in age from 18-35. They meet twice a month, but the location varies. Their FaceBook site is the best place to find the location of the next meeting. Each year they select a charitable organization to support, and this year’s organization is the American Refugee Committee. Laura is pictured below. Cindy recognized Ellen Dunn. Ellen is a senior at St. Olaf, studying public health. She has been selected as a Global Grant Fellowship Scholar. Ellen will study Global Health in London for a full year. NBMV Rotary is serving as her sponsor.